Check It: Chor Boogie and Trek 6 revamped the boom box mural for Basel 2013. Facing I-95 from Wynwood's west end on Northwest Sixth Avenue and 23rd Street, the Boombox mural is prime real estate in terms of street-art visibility. And it has occupied that space for three years, exponentially longer than most pieces last in the neighborhood. In 2010, street-art "gallery" Primary Flight asked Argentine artist Sonni to transform what was then an abandoned building. Sonni considered painting the building as a camera because of its rectangular shape, but changed his mind, drawing inspiration from Miami's music scene. “I made a boombox because of the shape of the building, and I think Miami is a musical city,” he says. Artist Sonni painting his latest mural December 2, 2013. He completed the mural in his cute-cartoon style, using primary colors, in time for Art Basel 2010. But the following December, someone painted an advertisement over the entire façade. Sonni was asked if he wanted to revive his creation, but opted not to. “When I finish a project, I’m finished and want to move onto something new. I have so many ideas,” he explains. 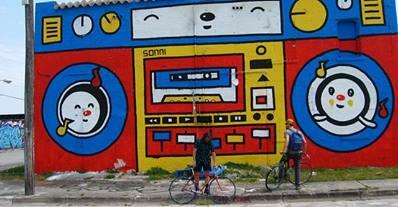 In the months following Basel 2012, Miamians began to miss seeing the Boombox, especially local artist Trek 6. He had never met Sonni, but the Argentine's boombox resonated with him, evoking memories of his younger days during the heyday of Miami booty-bass scene. Since Sonni had moved on, Trek 6 sought to bring the nascent landmark back to Miami. In March 2012, Trek 6 asked his artist friend Chor Boogie to help him paint it back. Chor Boogie, a prominent street artist from San Francisco -- he's sold a piece for 500,000 Euros -- was in town painting the Miami-Dade County Fair’s entrance wall. He and Trek 6 agreed to collaborate and a week later began spraying the old Boombox building with a silver-metallic base. Although wall art has a short lifespan, Trek 6 intends to keep the boombox around as long as possible. He’s maintained it since his collaboration with Chor Boogie, and through this year’s Art Basel. The Californian came to Miami to help freshen it up with new paint, because the sun had bleached its vivid colors and random graffiti had appeared. 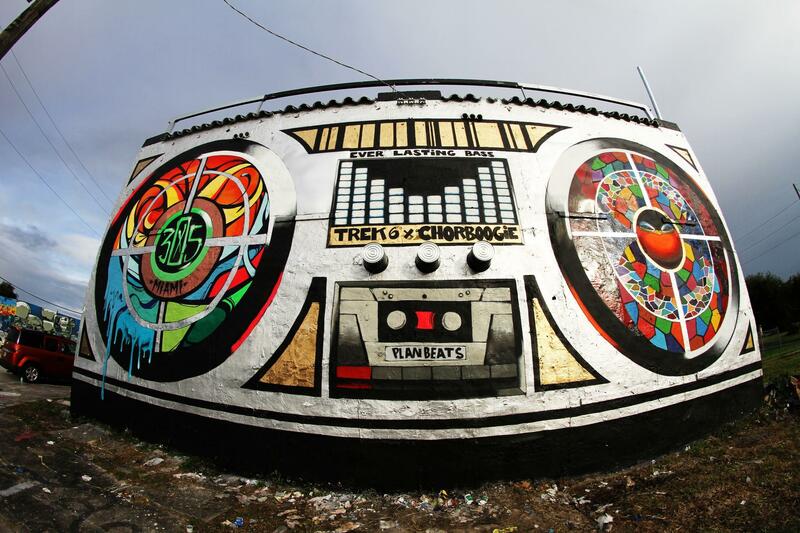 March 2012, artists Chor Boogie and Trek 6 revamped the defaced boom box building. Trek 6 enlisted local artists to paint on the building's sides and back. They added knobs and erected an antenna and handle on top to give it a more realistic effect. “Many of the walls in Wynwood were painted by artists from out of town. There’s a disconnect between the locals and them. I just met Sonni for the first time this week. He gave me a hug and we hung out. He’s an awesome guy,” Trek 6 says, discrediting any bad-blood rumors between them.